I lived in Kingston, Ontario for 9 years. I moved back to Toronto in January 2012, but I still visit Kingston frequently. Although I’m loving rediscovering Toronto’s restaurants and food festivals, I still miss my favourite restaurants in Kingston. Here’s a list of where I love to eat in Kingston. I’ve also included a list of things to do in case you’re planning a trip to Canada’s former capital city. My favourite meat shop in Kingston is Pig & Olive. Luckily, they now have a location downtown as well as uptown. I used to order fresh ducks from them. You can also find specialty meats such as elk, alligator, kangaroo, etc. Be sure to try their honey garlic sausages. If you’re looking for beef bones, do some grocery shopping at Bearances Grocery. When I was still living in Kingston, the butcher would give you free beef bones with a purchase from their store. Greco’s is my favourite Greek restaurant in Kingston. I almost always order the pork souvlaki. If you go for dinner, they serve complimentary taramosalata and it is absolutely delicious. My all-time favourite spring rolls can be found in Kingston. 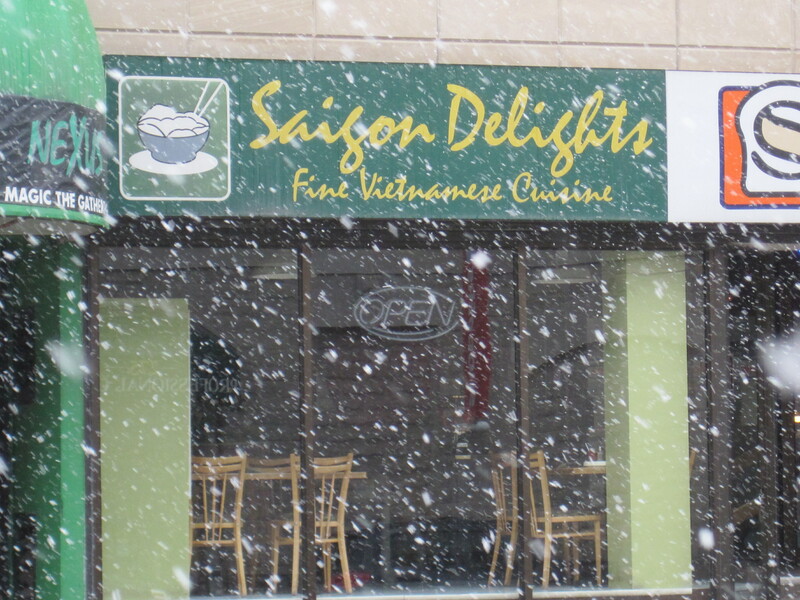 Saigon Delights, at 272 Bagot Street, ruined all other spring rolls for me. Other than menu item #6 with pork (BBQ pork and spring rolls on top of rice noodles), I don’t really like any of the other dishes there. 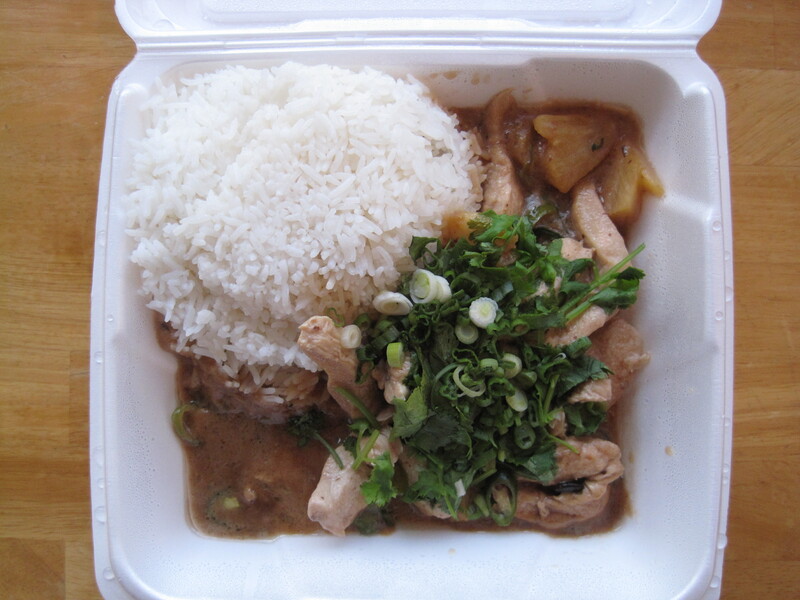 Kingston has a surprisingly large number of excellent Thai restaurants. Really, you can’t go wrong with any of them, and that’s all thanks to one family that started (and then sold) them all (see the interesting article here). The original family still owns and runs one of those restaurants which happens to be my favourite Kingston restaurant and my all-time favourite Thai restaurant. 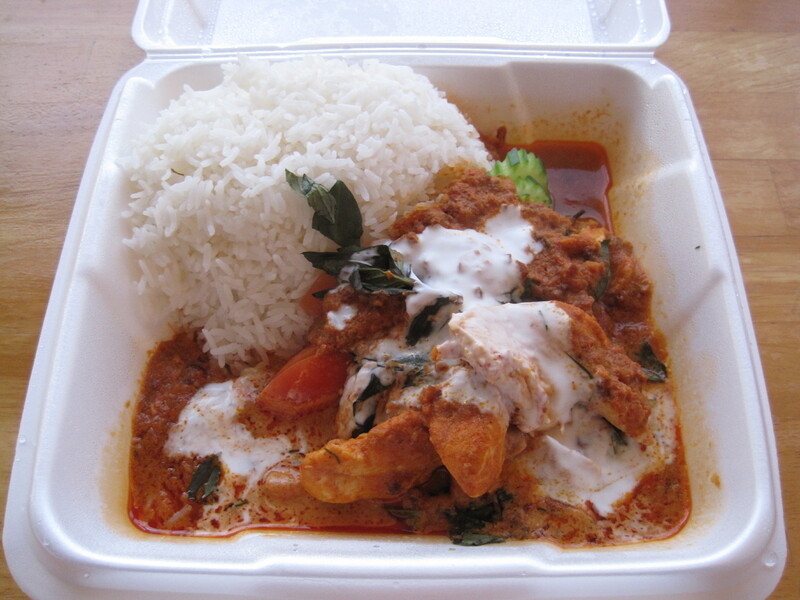 It is called Pat’s Cambodian Restaurant. It used to be at 887 Division Street, but has now relocated to downtown at 455 Princess Street. Note that they are closed on Sundays. They don’t cheap out on ingredients and they don’t take any short cuts, so if you’re in a hurry, I recommend calling ahead and ordering take out. 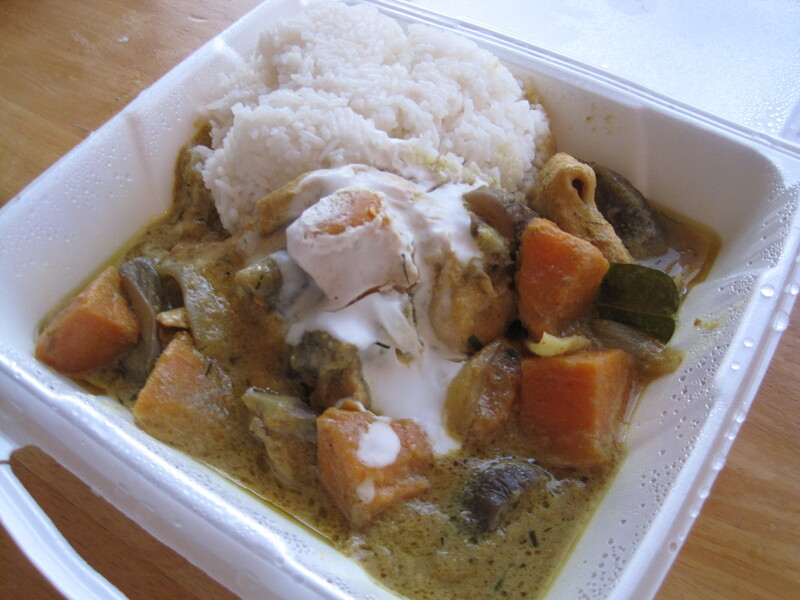 My favourite dishes are their tom yum goong, yellow curry chicken with sweet potato and eggplant special, chicken with coriander special, and phanaeng kai (red curry dish). Update: I am disappointed to say that the new Pat’s Restaurant is not as good or consistent as it used to be. I still go every time I’m in Kingston, and I still order boxes of it to go when I return to Toronto, but it just isn’t the same. 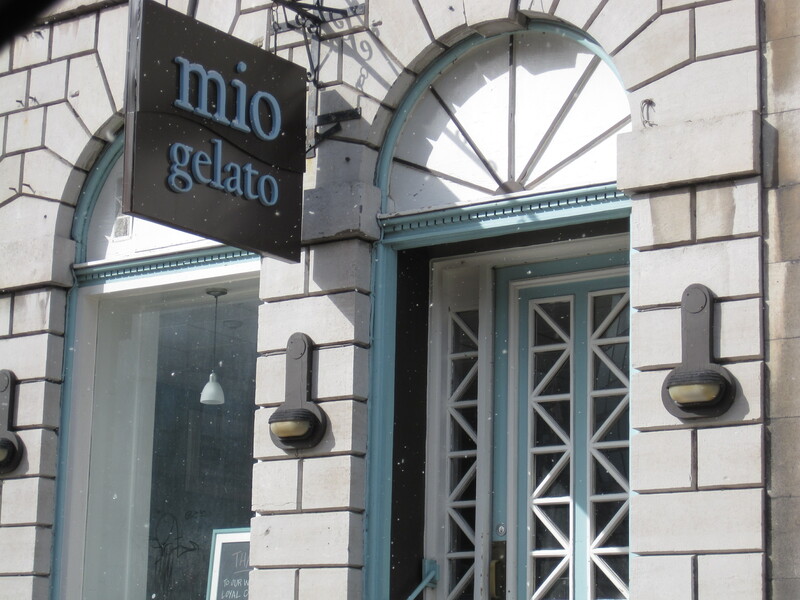 mio gelato in Kingston (178 Ontario Street) completely changed my opinion on gelato. Before Mio Gelato, I disliked gelato. In fact, my friend had to convince me to give mio gelato a try when it opened. I fell in love with their gelato, became obsessed with their sorbeto, and then I was going at least three times a week. It didn’t help that I lived down the street. 🙂 They will let you try different flavours before ordering, so you will definitely like what you get. I also love the taste of their cones, which have never leaked for me. A small comes with 2 different flavours and a large comes with 3. The flavours are, for the most part, very natural tasting and my favourite flavours are their passion fruit, salted peanut, and pistachio. Woodenhead’s is, in my opinion, one of the best restaurants in Kingston. Their gourmet pizza is made in a wood burning oven and is their specialty. They have very interesting topping combinations and I have found this restaurant to be consistently good. Although I don’t like any of their starters or desserts, they serve one of my all-time favourite wines, Echos Riesling from Tawse Winery. This wine, made in Niagara, Ontario, has an amazing grapefruit undertone and is not too sweet. Unfortunately, it is only available to restaurants. Gabriel Pizza is a chain that started in Ottawa. They make great pizzas if you like thick and chewy pizza dough. This is my favourite non-gourmet pizza place in Kingston. I love their bacon strips and roasted garlic toppings. 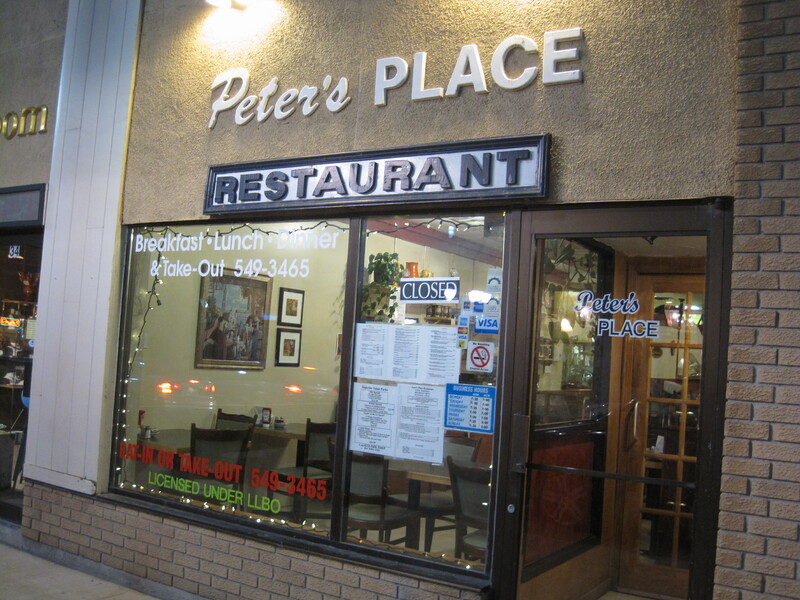 The best greasy spoon breakfast in Kingston is Peter’s Place Restaurant downtown. 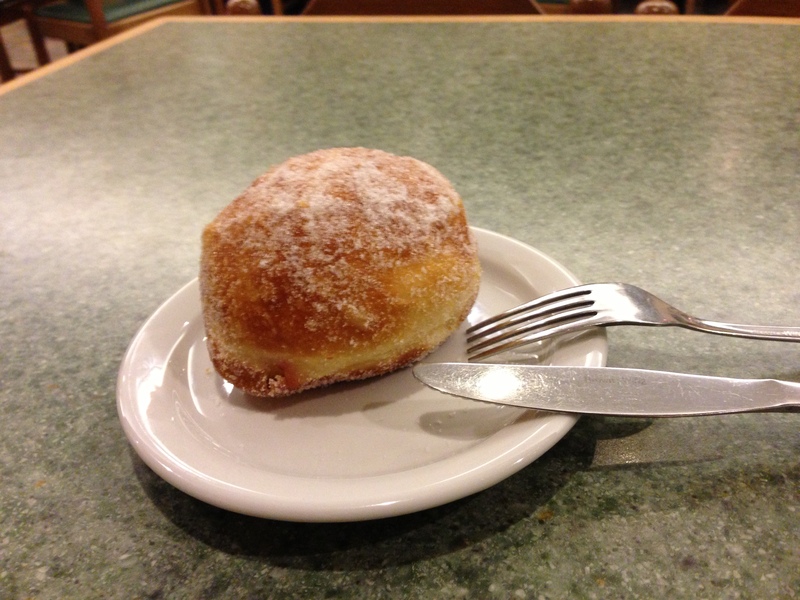 The best bread in Kingston can be found at Pan Chancho Bakery. They also have a great selection of gourmet and artisanal foods and a restaurant in the back that serves breakfast, brunch, and lunch. 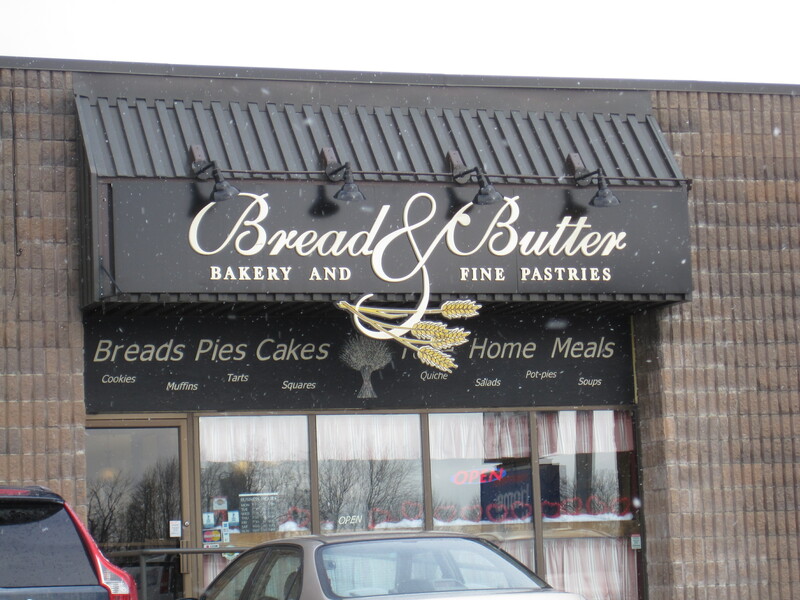 The best cakes in Kingston come from the Bread & Butter bakery at 1530 Bath Road. 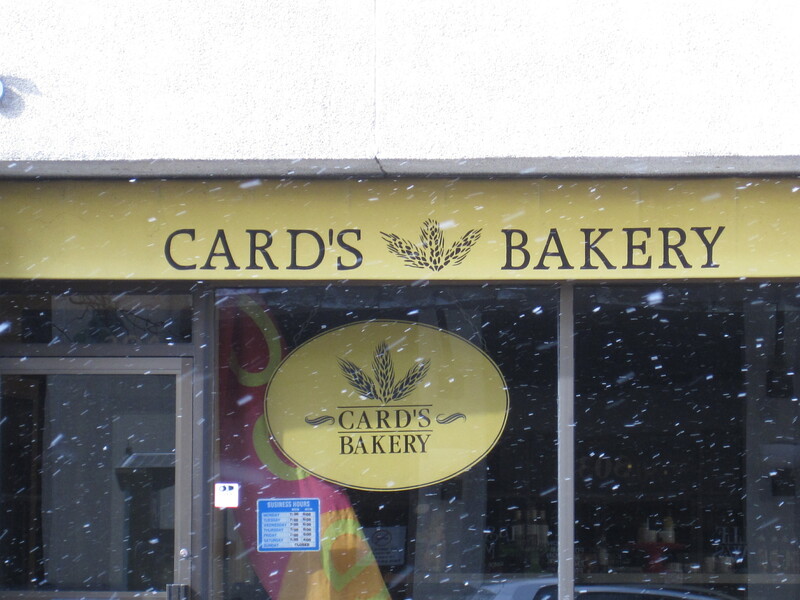 The best butter tarts and sticky buns in Kingston come from Card’s Bakery at 304 Bagot Street. My favourite shop in Kingston to look for imported and gourmet candy, chocolates, condiments, etc. is Cooke’s Fine Foods. Shop for jewellery. There are several jewellery stores downtown Kingston on Princess Street. You can get earrings for less than $10 at Tribal Voices and Modern Primitive. You will find a large selection of low to mid-range jewellery at Sterling. At Sterling, you will find pieces that are both classic and trendy, some are even hand-made. If you’re looking for mid to high-end jewellery, be sure to stop by Fiancée Jewellers. Even though I live in Toronto, I travel back to Kingston for my diamond jewellery, because Fiancée Jewellers carries high quality and GIA certified stones (they even use high quality diamonds in their thin diamond bands! ), they offer high quality workmanship (their stones aren’t set offshore), their prices are reasonable, they provide excellent customer service, and, above all, they have the best jeweller, Roula Vekios, who can recreate any design you like. I love dealing with Roula, because she is patient and honest, she has great advice, and she has surprisingly good intuition and understanding of what styles I like. My favourite Canadian clothing shop in Kingston is the Hatley factory store. If you love the combination of animals, witty jokes, and comfy clothes, you should definitely check this store out. I love their pyjamas and they usually have great deals on kids clothing. It’s also a great option if you’re shopping for non-typical Canadian souvenirs. My favourite tourist attraction in Kingston is the Penitentiary Museum. The Confederation Trolley Tour is really interesting, especially since Kingston was Canada’s original capital city. My family and I loved the facts and stories. In the summer, every Wednesday night, Fort Henry holds a sunset ceremony that includes fireworks. In the summer, once a week on a week night, a free movie is shown on a large screen under the stars in Market Square. This event is called Movies in the Square. In the summer, Kingston has a nice lakefront with walking paths and public bbq pits. Parasurfing is popular here. There’s also a place where you can rent kayaks on the lakefront. In the winter, the lake freezes over for skating, etc. Take the Wolfe Island ferry and see the wind turbines and the sandy beach on Wolfe Island. In the early spring, Maple Madness (maple syrup season) takes place at Little Cataraqui Creek. I love their medium maple syrup and they make delicious pancakes. If you don’t mind driving to Bon Echo Provincial Park, it’s a beautiful place to camp, kayak and rock climb. There are over 260 native pictographs there. If you don’t mind driving a bit further west, St. Anne’s Spa has long been known as one of Canada’s best spas. If you don’t mind driving outside of Kingston, the town of Picton has Sandbanks beach and sand dunes, great wineries, cidery, and cheese factory, etc. Picton is where Canada’s annual Great Canadian Cheese Festival is held each summer. There is also a casino in the nearby town, Gananoque, called the 1000 Islands Casino. If you like cross-border shopping in the USA, Watertown is about an hour drive away from Kingston and has large stores such as Target, Marshall’s, Kohl’s, Big Lots, and two malls. An outlet mall in Syracuse is about three hours drive from Kingston. In the winter, there is a free skating rink downtown that gets zambonied quite frequently. In the winter, cross country skiing at Little Cataraqui Creek is a lot of fun. They offer rentals so beginners are welcome. Please note that I’ve only listed some of my personal favourite things to do in Kingston. If you are planning a trip to Kingston, I recommend doing a thorough Google search for Kingston tourism for the typical suggestions, such as Fort Henry, the 1000 Islands cruise (if you do this, I recommend taking the boat tours that start out of Gananoque), the Haunted Walk of Kingston, Queen’s University campus, Royal Military College of Canada (great museums and history here), etc. Kingston is very well known for sailing and is a great place to learn parasurfing. Kingston and the surrounding area has many parks and conservation areas that are great for camping, hiking, picnics, dog-friendly outings, etc. You may want to see a show or watch a game at the K-Rock Centre. Kingston even has a roller derby team, Kingston Derby Girls. Buskers street festival comes to Kingston every summer. You will also find various museums and art galleries such as the Marine Museum of the Great Lakes, Pump House Steam Museum, Museum of Health Care, Agnes Etherington Art Centre, etc. The farmer’s market is available a few times a week and antiques are for sale on the weekends in market square, downtown. In February, Kingston has a winter festival called Feb Fest. Just outside of Kingston, you will find fruit-picking farms. The nearby town Gananoque has a rib festival each summer. The list of festivals, events, play houses and theatres, etc. goes on and on. Also, feel free to ask me any questions in a comment. I lived in Kingston for 9 years and continue to visit regularly. I lived in Kingston for a few years and only knew a tiny fraction of your list. Nice list! I have lived in Kingston for almost 20 years now, and I must say that I agree with most of what you have here. I love, love, love Dong Nai for Vietnamese – best in Kingston, hands-down, and Copper Penny for burgers. 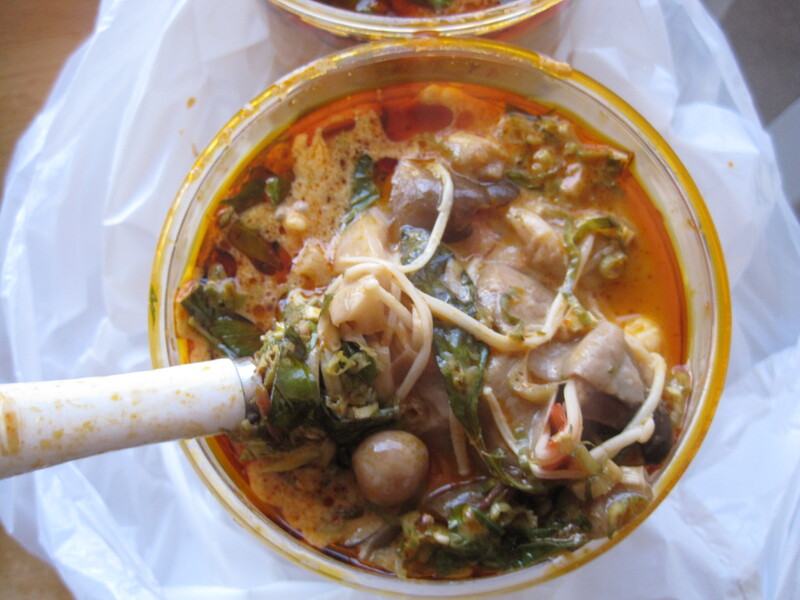 Heading to Pat’s with some friends for lunch – and the best Tom Yum goong I’ve ever had. Cheers!